Usually, a house on Berkeley Square can be associated with one principal owner, either the builder or the longest-term resident. In the case of #10, it seems that four tenants have about equal claim to naming rights. Even still, there is at least one sizable gap in the ownership history of #10; and while we do have a lead on a possible architect, albeit an obscure one, only a single grainy illustration of the house has been found so far, one from the Los Angeles Times of September 27, 1925, seen here at top. Consummate Westerner Harry P. Taylor was born in Salt Lake City in 1876, wending his way through Oberlin and Cornell before being graduated from the Colorado School of Mines in 1900. For the five years afterward he was variously the superintendent and examiner for corporations and individuals conducting mining operations in Oregon, Idaho, Montana, and British Columbia. The famous Goldfield boom, the last big gold rush in the West, brought him to Nevada in 1905, where he made a fortune in gold production over the next four years before selling out and, leaving no Western State unturned, moved to Los Angeles to pursue oil, mining, and land deals in the Golden State. Taylor's vigor made him popular among the Big Swinging Dicks in his adopted city, and he was elected in short order to, among other clubs, the California and the L.A.C.C. He also celebrated his hard work with a new house of his own behind the exclusive gates of Berkeley Square. Living first at 2311 South Gramercy Place, a still-standing house hard by the western gates of the Square, Taylor acquired Lot 24 from the Burkes in late 1908. In December 1910 he took out building permits for a 14-room house on which he intended to spend $20,000, later adding a two-story, granite-and-frame garage containing a machine shop. 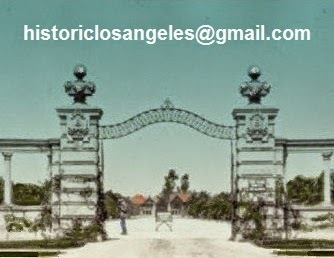 It appears that he commissioned Los Angeles architect John C. Smith to design the house. About all we know of John C. Smith is that he had an office on the second floor of the Alfred R. Rosenheim-designed H. W. Hellman Building downtown (Rosenheim's own office was four floors up) and that he designed a commercial building or two and and at least one school—which, it must be said, would not seem to recommend him for a high-end residential project. The length of Taylor's tenancy at #10 is uncertain. He had married Lois Nesmith in Minnesota in 1903 and had three children, and, while clubbable, seems to have kept a low profile socially. While Taylor is hard to trace during the 1910s, he was apparently living on St. Andrews Place in the Wilshire District later in the decade. Short-term renters of #10 for some time on either side of 1920 were Mrs. William L. Davis—not to be confused with the William Henry Davises of #25—and her daughter Lidia; little is known of mother and daughter, or what might have happened to Mr. Davis. In their place came the Frank Henry Reilleys early in the decade. What Frank Reilley did with himself during the day is a mystery—unlike the usual directory listing for your average Berkeley Square man, there are no boldfaced notations indicating presidency of or partnership in any particular business. About all we know is that he was a Son of the American Revolution, with antecedents in Massachusetts. The extended Reilley family seems to have later settled in Buffalo, New York; Frank appears to have arrived in Los Angeles at least by the turn of the 20th century. There in 1905 he married Florence Jones, who was born in Xenia, Ohio, in 1875, moving to L.A. as a child, where she was educated privately before going on to Stanford—unusual for a woman at the time, and indicating an independence that might explain her being 30 when she married. (It does not explain, however, why, according to the 1914 Woman's Who's Who of America, she was "against woman suffrage.") 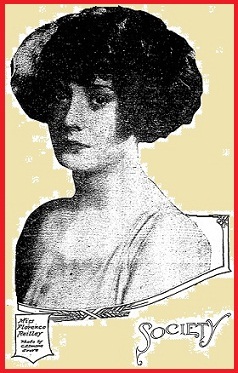 Florence was the daughter of Dr. Cummins Butterfield Jones and Alice Ewing Jones, who seem to have been well-regarded socially in Los Angeles before the turn of the century. They were definitely Old West Adams, living at 2302 South Flower in 1899, later migrating west within the district to 2101 South Gramercy—a block from the gates of Berkeley Square and, incidentally, the very house, still standing on the north edge of the freeway, in which Marvin Gaye was killed by his father in 1984.
a few months she would be married, at 16, to James Albert Phillips Jr.
family hands of fifth-generation Angelenos. The Reilleys had two children: Ewing, born in 1906 and named after his maternal uncle who had drowned in 1902, and Florence Jr,, born in 1908. They lived with the Joneses on Gramercy until about five years after Dr. Jones's 1916 death, at which time the Reilleys and Mrs. Jones moved to the Square. During their time at #10, Florence Jr. married rather suddenly and moved to New York, leaving the older members of the household rattling around in a big house with no debutante party or wedding reception to look forward to. The Reilleys and Mrs. Jones were at #10 until late 1925, when they sold to the Charles F. Sterns; after a spell at the Gaylord apartments on Wilshire they were back on the Square by late 1926, taking #21 between the Buchanans and the Fusenots. Frank Reilley seems to have expired around 1930, with his wife then moving downtown to the Biltmore. She died in 1943, while her mother, by now living at the Huntington in Pasadena, lived on to see great-great grandchildren, dying at age 99 in 1952. Charles F. Stern, born in Arcata, California, in 1880, had plenty of boldface notations following his name in city directories. At the time of his move to Berkeley Square around the beginning of 1927, he was president of the Pacific-Southwest Bank as well as executive vice-president of the First National, which were under one umbrella. The entertainments began in April, when Stern invited his old Berkeley classmate, William L. Finley, the Oregon State Game Commissioner, to give a talk at a stag dinner for 75 at #10. The subject was "Wild Animal Outposts," which ostensibly promoted the setting aside of vast areas for wildlife conservation. No doubt by the end of the evening the stags were plotzing at the thought of setting up new camps from which to cull the various coveys, flocks, herds, traces, and flushes. The good times at #10 were interrupted a couple of months later when Stern, along with 40 or so other big Southland muckety-mucks including Motley H. Flint (also of the Pacific-Southwest banking group), Harry Haldeman, and none other than Louis B. Mayer of Metro-Goldwyn-Mayer were charged with, among other things, embezzlement and violations of a law governing bankers' bonuses in connection with the famous Julian Petroleum scandals that had recently been exposed. While Motley Flint was shot to death in court during a later related trial, it is not clear what happened to Stern in legal terms. He seems to have escaped time in the clink—in 1929 he was listed as vice-president of the merged Los Angeles–First National Bank and Trust company, though another merger the following year did not include him. By 1932 he had moved on to the oil and gas business, and later served as a state highway commissioner and, curiously, as a state superintendent of banks. Why not? Mrs. Charles F. Stern was the former True Aiken. She and Charles had three sons and were living near the corner of Wilshire and Ardmore in 1923 before moving to 2151 West 21st Street near the Square, and soon after to #10. True did the usual good works of all Berkeley Square matrons, including on behalf of Children's Hospital. After leaving #10, the Sterns moved to Beverly Hills, and then to Glendale in 1942, where they lived until their deaths. Charles died in 1960 and True in 1961. Both are buried in Glendale at Forest Lawn, where Stern, as a member of its advisory board, had helped launch the graveyard-as-Disneyland era in the '20s. Who lived at #10 after the Sterns is something of a mystery. 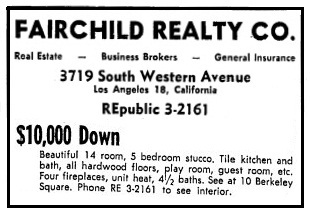 There are no listings for the house in available city directories during the '40s. There is a classified ad in the Times of February 6, 1949, offering it for sale for $20,000. Dr. and Mrs. William Clyde Allen and their children might have been the African-American family cited in some sources as the first to have moved to Berkeley Square—to #10—in 1951. The Allens were civic activists and brave pioneers in the fight to break restrictive housing covenants in Los Angeles, alongside other prominent West Adams residents including movie stars Hattie McDaniel and Louise Beavers. In 1957, William Clyde Allen Jr., a student at Mount Vernon Junior High School, made the paper when he won a $1,000 essay contest with his entry titled "Why I Have Faith in God and in the Future of the World." While Clyde Jr. himself lived up to his early optimism—he earned a doctorate and became a psychologist, and was in addition an accomplished composer, music director and conductor—there was little future for the world of Berkeley Square. Although any specific plans for the Santa Monica Freeway seem likely not to have been understood by the general public at the time, the Allens put #10 on the market in May 1959. As highway details began to be revealed, the prospect of a buyer other than condemning authorities might have seemed unlikely; in any case the Allen family left the house in June 1960. It is not known who may have been the buyer, if it was other than a government agency, or just when #10 was finally demolished, but the river of cars was on its way. "The asphalt street that ran through Berkeley Square was very wide. This allowed for residents or visitors to park diagonally at the curb and to have more parking space without having to be concerned with being ticketed—the street was private property. Neighborhood kids could play baseball in the Square without having to fear vehicular traffic interfering with the game or causing accidents. Berkeley Square, of course, was a gated community. On the east end was the Western Avenue gate. This was eventually closed sometime during the early 1950s. The opposite gate at Gramercy Place had a security officer. Soon the officer was removed and access to Berkeley Square by the general public became available. Undesirable youths from various neighborhoods—outside of Sugar Hill—came into the Square occasionally and caused fistfights with those who lived on the block. On the weekends—particularly on Sundays—uninvited visitors cruised the Square and became bothersome lookie-loos, boldly asking homeowners questions of property costs and what it took to become a resident. "The entry door of #10 faced west. Upon entering, one would find themselves in the parlor—sometimes referred to as the reception hall. One would notice the highly shellacked hardwood floors, mahogany walls, mahogany ceilings and exposed mahogany beams. Long mahogany sliding doors with floor-to-ceiling glass panels separated the parlor from the living room—in this instance the living room was truly a great room. "The huge mahogany formal dining room was on the east side of the residence, adjacent to the great room, and shared its design theme. It had a fireplace on the west wall. A sliding mahogany-and-glass door separated the dining room from a less formal dining area for the family. On occasion, my mother would open the sliding door to accommodate a greater number of dinner guests. A swinging door in the dining room opened into a north-south hallway that eventually led through a butler’s pantry and to the kitchen. The kitchen was approximately 20 feet square with a center island. A doorbell was attached to the south wall near the ceiling in plain sight—next to the doorbell was an arrow attached to a clocklike dial for determining at which of the residence's six doors someone had arrived." "Toward the center of the backyard of 10 Berkeley Square was a concrete pond with Lilies of the Nile planted around its base. The pond was about two feet deep and perhaps eight feet in diameter. It contained giant goldfish. Rarely did they have to be fed because they ate the tadpoles and other small fish or insects that cohabited with them. Large turtles and frogs frequented the pond and eventually had to be removed because of their population and because the family dog—Nipper, a red-haired cocker spaniel—became annoyed by them. "The backyard had several types of trees. Between the east exterior wall of the house and the east property line was a bamboo garden that stretched down that side of the house. A stone walkway divided the bamboo garden from the residence and my mother was oftentimes found enjoying its shade during the summer months. Elsewhere in the garden, avocados were plentiful, as were lemons, apricots and peaches. My mother frequently served a pitcher full of lemonade to the family in the backyard during the warm summer afternoons and evenings. There were other trees and bushes in the yard, many of which attracted honeybees, wasps and spiders—very large spiders. During the spring and summer months, while playing out back during the daylight hours, one had to be alert for bees and wasps. Kanati got stung by wasps—twice—and he remembered the incident for decades thereafter. During the evening hours, huge spiders—really huge spiders—would string their webs here and there. One had to be careful where one walked. Oftentimes, my father would use a tennis racket or piece of lumber to strike the spiders as if they were baseballs. They almost sounded like a ball hitting a bat when they were struck. By the late 1950s, the large spiders seemed to disappear. "Attached to the garage on the east side was a one-bedroom cottage for a groundskeeper, custodian or caretaker. It was complete with a large living room, bedroom, full-sized bathroom, and kitchenette. During the afternoons in summer, the cottage bathroom was very convenient for the young Allens and their friends after having consumed the Nehis, Mother’s Pride and other sodas and candies of the era. At one time, my father had the cottage furnished for visiting relatives and overnight guests. "Directly behind 10 Berkeley Square, on the opposite side of the alleyway, was 24th Street Elementary School. Although it would have appeared easier to walk across the alleyway to attend school, its access gates were locked. Hence, the necessity for the Allen boys to walk around the corner to enter the school from the front, if they weren't driven by one of their parents." Thus passed the glory of Berkeley Square.